PWInsider's Mike Johnson has reported that the WWE are seemingly not doing any more of 'Bring it to the Table' on the WWE Network. Johnson revealed that the company has stored the set of the popular show because they are not using it again. The last edition of the Bring to the Table appeared on the Network back in late July. 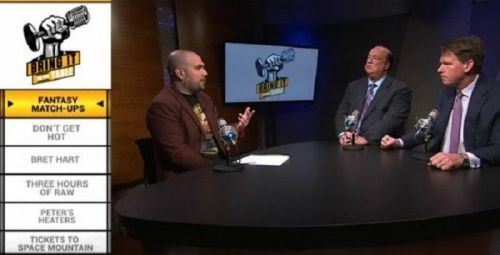 'Bring it to the Table' was a series on the WWE Network hosted by Peter Rosenberg with WWE Legend JBL and Commentator Corey Graves as the guests on the series. The shows would see the trio talk about the numerous issues within the WWE from a non-storyline/kayfabe way (but generally from a pro-WWE perspective). It had a habit of arousing headlines, especially with the opinionated JBL and Graves, who would be asked about anything, such as the WWE Universe booing Roman Reigns or Enzo Amore having backstage heat. However, in September, the 'longest-reigning World Champion in SmackDown history' and commentator on SmackDown Live JBL announced that he would be leaving the WWE. It is believed his public conflict with fellow WWE commentator Mauro Ranallo, which escalated due to comments from JBL about Ranallo on Bring it to the Table, led to JBL's decision. It definitely looks like JBL's WWE Exit resulted in Bring it to the Table not continuing on the WWE Network after 6 episodes. Although Paul Heyman filled in for JBL on a couple of occasions on it earlier in the year when JBL was not available, Heyman probably does not have the time to do it regularly and his off the cuff remarks sometimes may not be to the liking of WWE on a show like Bring it to the Table. It is entirely possible that recent financial cuts within WWE also played a part in causing Bring it to the Table to its end. Now that the show has ceased to exist, it will be interesting to see if WWE cuts back on any other WWE Network programming. Bring it to the Table was a cool, unique show, mainly because we had not seen WWE have people speaking so freely about the company from a non-kayfabe point of view on any of their programming before. Peter Rosenberg is actually a really great host and I have liked the way WWE have used wrestling podcast guys like him and Sam Roberts over the past year on the WWE Network. As we know from RAW and SmackDown Live, Corey Graves has become an integral part of WWE's commentary desk. His presence on Bring it to the Table was a welcome one. It would be good if they found something else for Rosenberg to do on the Network, of course apart from appearing on PPV KickOff shows, and I reserve the same thoughts on Graves too. It is a pity that JBL's departure has led to the departure of Bring it to the Table from the WWE Network.